The small mountain town of Crested Butte, Colorado is the place to be this winter. In the first two weeks of January 2017, the historic ski town has recorded 112 inches of snowfall, up from 31 inches of snowfall recorded during the entire month of January in 2016. A former coal mining town, Crested Butte is touted for being “the last great ski town” with roots in the skiing industry dating back to the 1960s. Today, Crested Butte’s authentic small town charm and gusto is about as alluring as it gets for visitors looking to explore the great outdoors, and enjoy a relaxing weekend filled with world-class scenery, delicious food, and locally-made libations. With snow continuing to blanket Crested Butte, and more importantly, Crested Butte Mountain Resort, we’ve put together our tips for how to eat, sleep, and play in this charming ski town. Crested Butte’s dining scene is everything a mountain town dining scene should be: absent of chains, full of hearty and delicious food, and loaded with warm and inviting places perfect for capping off epic ski days with après adult beverages. Start your day in Crested Butte on a healthy note with a fresh-pressed juice or smoothie at A Daily Dose. This coffee, juice and breakfast joint is perfect for a grab-and-go breakfast before you catch the free ski shuttle that loops from downtown Crested Butte to the resort every 15 minutes throughout the day. If après shenanigans are spent on the slopes, don’t miss the chance to check out the Umbrella Bar—a new addition to the resort. Located at the top of Painter Boy run, Umbrella Bar boasts exceptional views, thanks to a retractable roof which is typically open on bluebird days. On the menu you’ll find delicious snacks and European-style bites like sausages, sauerkraut, paninis, fondue and a plenty of adult beverages. If you’re in town during happy hour, hit up Montanya Distillers. This longtime mountain distillery is producing three different kinds of barrel-aged rum using all-natural ingredients. 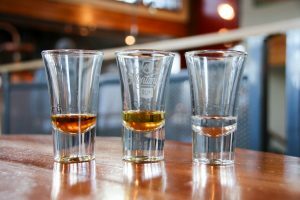 Small tastes of each of the smooth rum offerings are available at no charge, but chances are, you’ll want to order full pour on it’s own, or as a part of one of the many exceptional craft cocktails available in the tasting room. Montanya Distillers also serves up elevated small plates and operates a pho hotline for diners to call in their pho to-go orders for pickup everyday from noon to 3 pm. For dinner, sit down for a spicy bowl of curry at Ginger Cafe, or order any one of the other flavorful dishes on the menu. This restaurant fills up quickly, so make reservations if you’re planning on enjoying the delightful food and speciality cocktail menu that Ginger Cafe has to offer. And while Crested Butte has yet to see the opening of a craft brewery in town, they’re home to one of the best craft beer bars in western Colorado. The Brick Oven Pizzeria and Pub not only boasts 30 beers on draft, but also has an exceptional—and I mean exceptional—beer cellar filled with rare, limited-release, and aging beer from some of the top breweries in the country. Pair that with slice of artfully made pizza and you’re set for the evening. At the entrance into town, and just steps away from downtown Crested Butte, is the budget-friendly and cozy Old Town Inn, where guests will find homey accommodations and complimentary breakfast filled with freshly baked pastries and endless coffee every morning. Old Town Inn weekend nightly rates this winter can be found for as low as $109, but the quaint inn books pretty far in advance, so make your reservations ahead of time. If you only having skiing on the brain and want to spend as much time on the mountain as possible, check out The Lodge at Mountaineer Square. This beautiful and new property in the heart of Crested Butte Mountain Resort is located steps away from lifts, and offers a range of accommodations to meet the needs of everyone from the solo traveler, to larger groups. Pricing begins around $215 per night during the winter, but book the Stay and Ski Package and receive a discount on both lodging and lift tickets. Crested Butte is the ultimate mountain playground in the wintertime, and with record-breaking snowfall this year, this town is the place to be for fresh powder and bluebird days. On the mountain, check out Crested Butte Mountain Resort’s three terrain park options, or one of the many runs geared towards beginner and intermediate skiers and boarders. 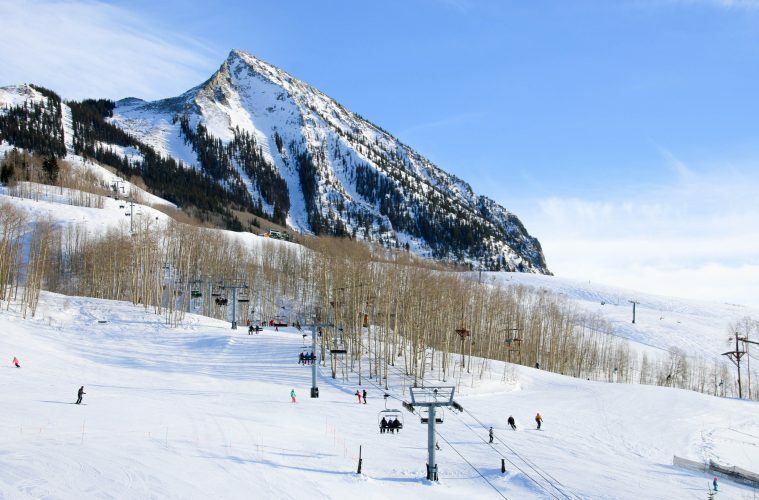 Crested Butte Mountain Resort offers a handful of deals on lodging and lift tickets throughout the season, so stayed tuned the resort’s deal page to take advantage of the budget-friendly deals. While hitting the slopes is one of the top winter activities in Crested Butte, this small town isn’t just a one trick pony. 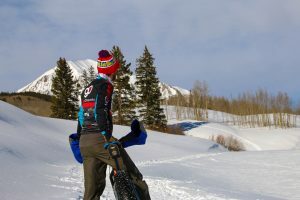 Home to the oldest mountain biking association in the country, Crested Butte has a killer fat biking scene in the cold weather months. For bike rentals (and all of your other gear and apparel needs while in town), check out The Alpineer. Bike rentals are available at hourly and daily rates. Check out Crested Butte Mountain Bike Association’s website for trail maps, trail status, and a list of suggested rides, and if you just can’t get enough of fat bikes, don’t miss the fun and funky Fat Bike World Championships which take place in Crested Butte January 25-29. For a more mellow winter activity, rent snowshoes and take advantage of the 55 kilometers of groomed trails around town. Crested Butte Nordic, non-profit organization in town that dates back to the 1980s, is the place to go for all things nordic skiing and snowshoeing. Trail passes can be purchased for $20 a day, and skate skis and snowshoe rentals are available for adults at $20 per day. And if you’re really looking for a unique experience, reserve a space on one of Crested Butte Nordic’s Magic Meadows Yurt Dinner Experiences. 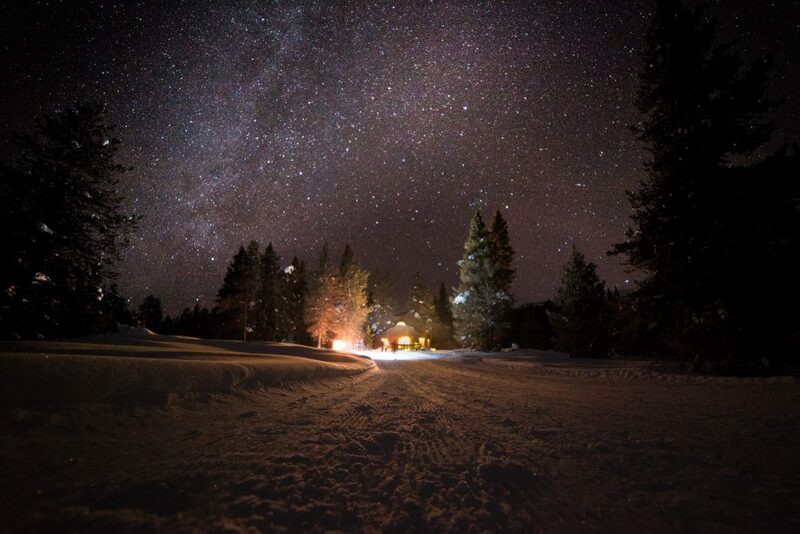 This all-inclusive experience includes snowshoes rentals, trail passes, a five-course dinner, live music, and plenty of libations—and if you’re lucky—a night sky full of stars as you make your way along the trails back towards town. The Yurt Dinner Experience is $135 for adults, and $85 for children.